Original 2014 24 Hours of Le Mans Poster. June 15 and 16, 2014. 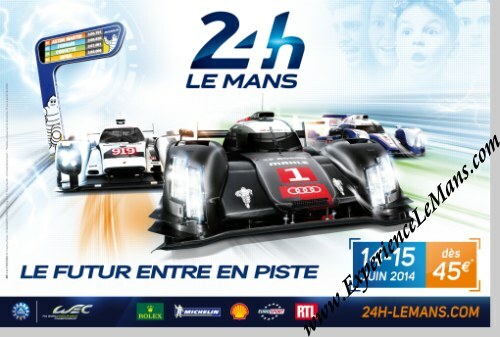 The 2014 Le Mans poster is part of the era in Le Mans posters which is generally described as "The Le Mans Poster in the era of computer graphics and sponsorship" and which lasts from 2001 until the current day. The 82nd edition of the Le mans 24 Hours is placed under the banner of innovation and the poster defines an area of rich expression aimed at a wide-ranging public by projecting them into a powerful and attractive imaginary environment. Pride of place goes to the new prototypes launched in 2014 which, propelled by luminous, electric colors, leap out of the poster. A cleaner and less figurative universe than in the past, which fits perfectly with the new slogan: "Le future entre en piste" which loosely translates into "The future enters the ring". For the fifth time it is the fruit of collaboration between the Automobile Club de l’Ouest and the LAFOURMI communications agency. The event was won by Benoit Treluyer, Marcel Fassler and Andre Lotterer in their number 2 Audi R18 E-Tron Quattro. For the full results of this race, please see 24 Heures du Mans results 2014.